A vigil for the Eaton Centre shooting brings out passionate pleas for support for low-income neighborhoods in Toronto. 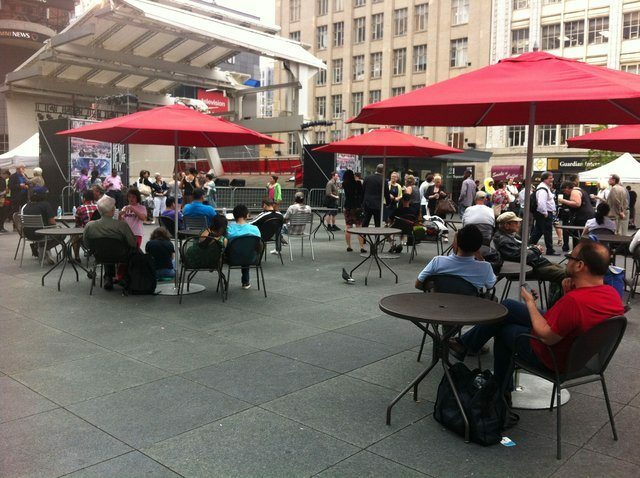 The crowd yesterday at a vigil at Yonge-Dundas Square. Photo by Bronwyn Kienapple/Torontoist. Huddled under the red umbrellas of Yonge-Dundas Square, a small crowd gathered in the pouring rain last night, as community leaders spoke their minds about gun violence. Named a “Vigil for a United Gun-Free Toronto” and organized by city councillor Kristyn Wong-Tam (Ward 27, Toronto Centre-Rosedale), yesterday’s gathering was in direct response to the Eaton Centre shooting that took place earlier this month, but also spoke to broader concerns about gun violence in Toronto. The speakers were emotional as they discussed the need for job opportunities, social support, stricter gun laws, and an end to the perception by many Canadians that gun violence is mostly the problem of a remote, “other” population. The consequences are real and heartrending–speaker Elaine Lumley lost her only son to gun violence. She advocated for tighter gun control, decried the end of the long-gun registry, and also warned the audience that the shooting at the Eaton Centre should be a wake-up call to Torontonians regarding the gun violence that has long existed in this city. Hani Afrah, who lives in Regent Park, agreed with Lumley. “It’s really sad that this happened in the Eaton Centre, but it happens all the time in my neighborhood,” she said. She and her brother Ismail (who are students at George Brown and U of T respectively) both agreed that social programs, especially mentoring opportunities and job assistance for youth with a criminal record, are crucial to combating the disenfranchisement that leads to violence. Ismail Afrah also pointed out that while Canada provides services like welfare and both primary and secondary education, creating a healthy community in Regent Park and other low-income neighborhoods depends on more than just meeting basic needs.